including boogie boarding, surfing, kayaking, paddleboarding, snorkeling, and more! In addition to water instruction, our marine educators lead the exploration of local habitats including dunes, salt marshes and tidal pools. Campers receive expert instruction and care from our highly trained team. 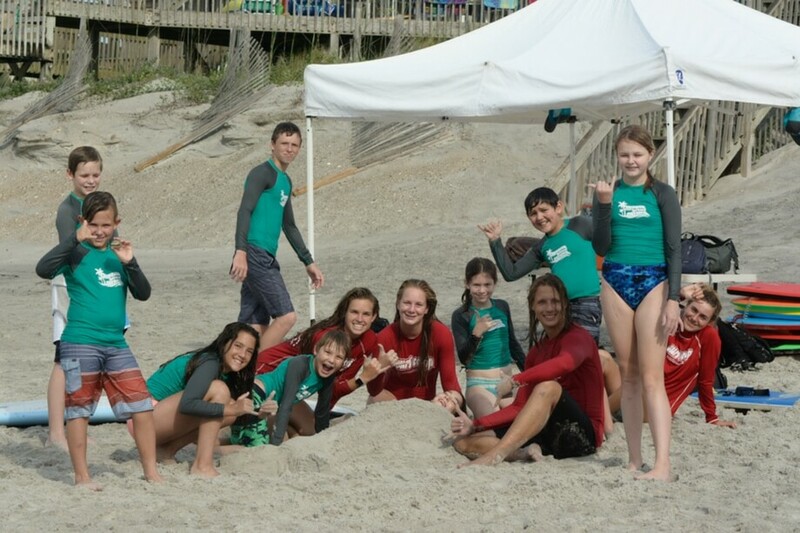 Prior to camp, our staff participate in a week of training, which includes life-guarding, marine science, surf coaching, ocean ecology, childhood development and behavior management. We are dedicated to being partners in parenting with all of our families. Includes: lodging on Topsail Island (in air-conditioned, ocean view rooms), all meals, 24-hour same gender adult supervision, equipment and professional instruction for all activities. Also included: transportation (including pick-up and drop-off from Wilmington International Airport-ILM), Sea Turtle Hospital donation, camp t-shirt and group photo. Families are responsible for round trip airfare to ILM or transportation to Topsail Island. Upon arrival to the beautiful North Carolina coast you are met with the anticipation and excitement of fellow participants, parents, and counselors. 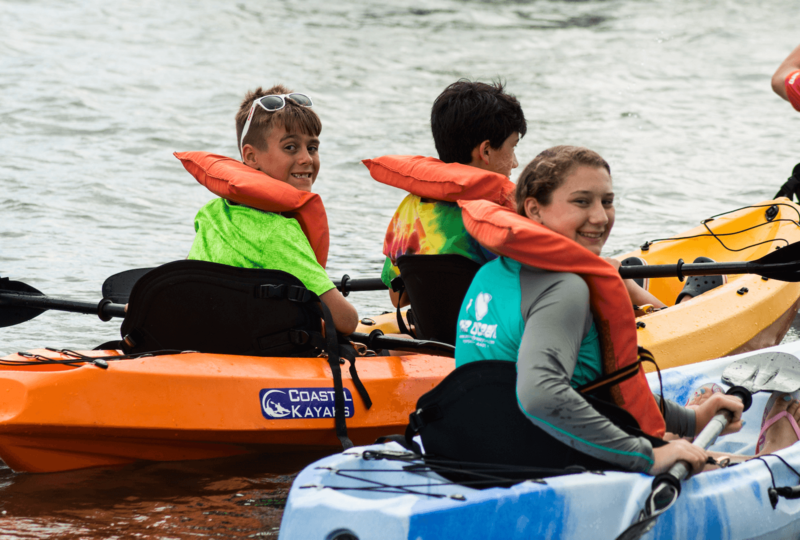 It’s time for your camper to begin their journey as an ocean explorer! 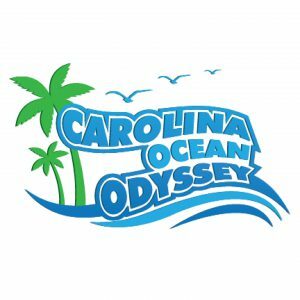 At orientation, the camp schedule and rules for the week will be explained by the Carolina Ocean Odyssey team. After orientation, your camper will take a walk across our private beach access and take their first swim in the ocean. Then it’s off to the dining hall for dinner, followed by evening beach activities where we’ll spend time playing games and getting to know each other. We will close out the day with opening campfire then head back to the bunks. The morning waves call early and we have to make sure we’re there on time and prepared! This morning marks the start of a new odyssey! 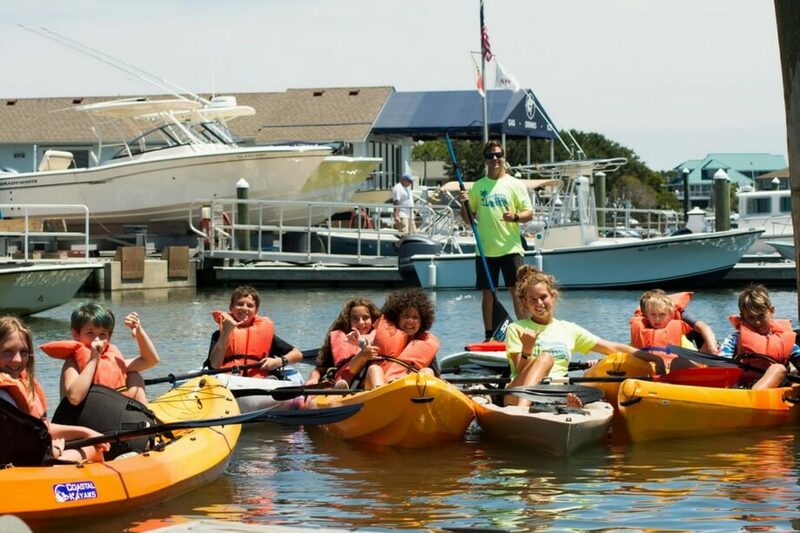 Your child will spend the week learning the fundamentals for becoming a true ocean adventurer. From the crest of a wave to the muddy depths of the salt marsh, we’ll explore them all, learning many valuable lessons along the way. 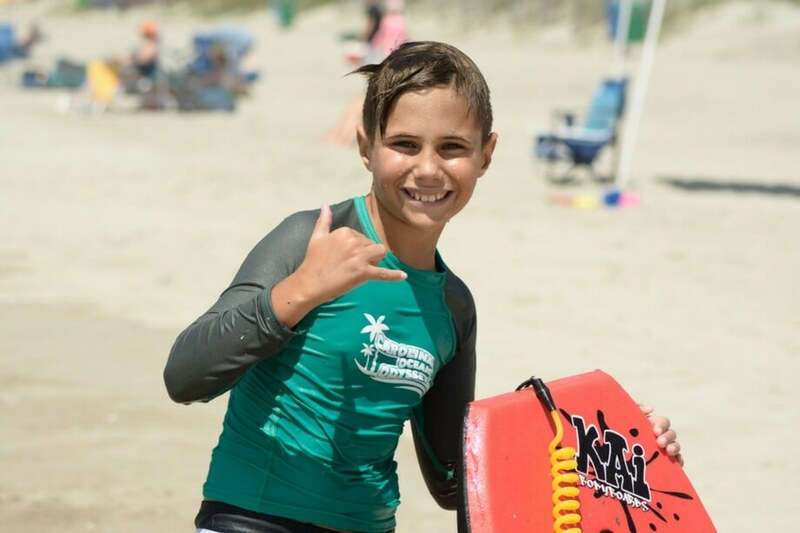 After breakfast, your camper will head straight to the beach for a lesson on reading ocean conditions and boogie boarding basics. Then, it’s nothing but catching waves in our first boogie boarding session. 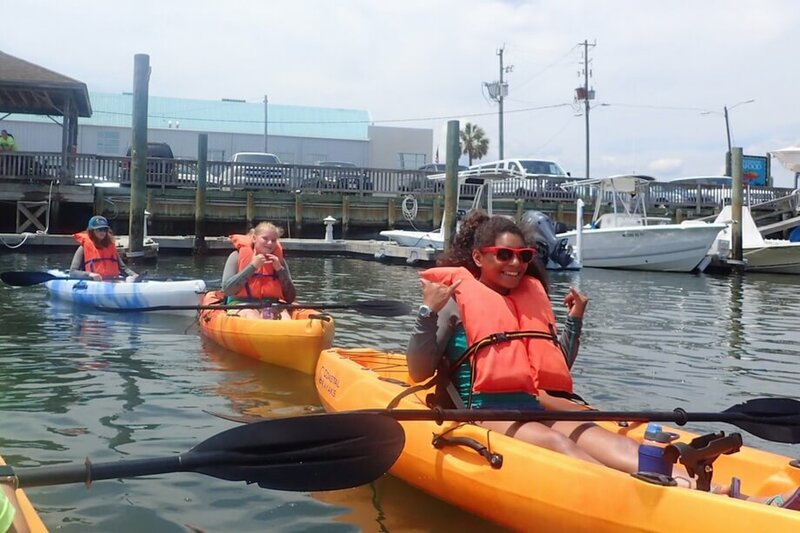 After lunch and a short re-charge time, we will head to the sound side of Wrightsville Beach for a kayak lesson and eco-tour. To keep the stoke flowing, we’ll head back to Topsail Island to finish out the afternoon with another boogie boarding session. Following dinner, we will dig into some marine science with a game about sea turtles. Your camper will begin the morning with breakfast, followed by some advanced boogie boarding techniques in the waves in front of our beach access. Then a quick rinse and it is time to head to the Karen Beasley Sea Turtle Hospital. Your camper will get to see real live sea turtles! From egg to hatchling to adult, turtles face many threats both on land and in the ocean. Your camper will become familiar with some of the obstacles they face while also seeing the positive impact humans can have, through the tireless work that the dedicated volunteers do at the hospital. Tuesday afternoon it’s back to the beach for advanced boogie boarding practice. 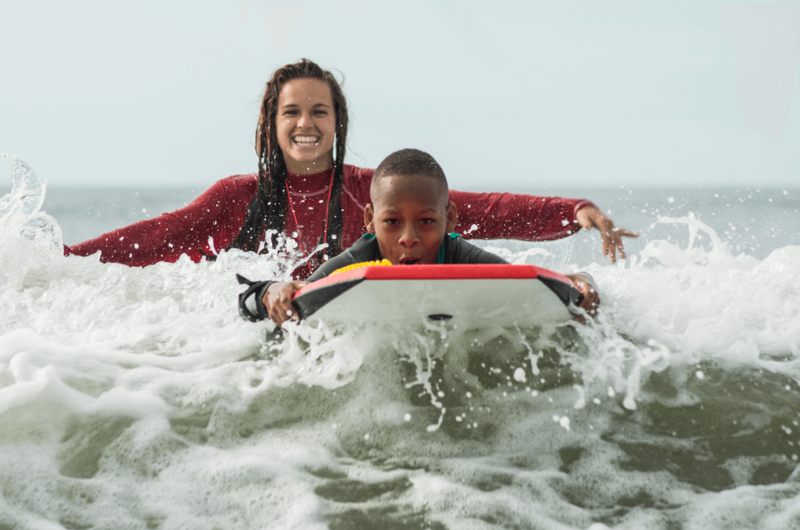 Building on the skills from previous sessions, campers will learn the concepts of wave dynamics, how to catch waves without assistance, riding the line, and even tricks! Taking a break from the sun we will head back to our ocean view campus for a snack and camp activities. The day will be closed out with a camp-wide evening program. We’re half-way through our week of adventure. Today is our chance to apply all of the ocean skills we have learned. It is our first day of surfing! We will spend the morning with the professional instructors of WB Surf Camp learning to ride the best waves we can find. 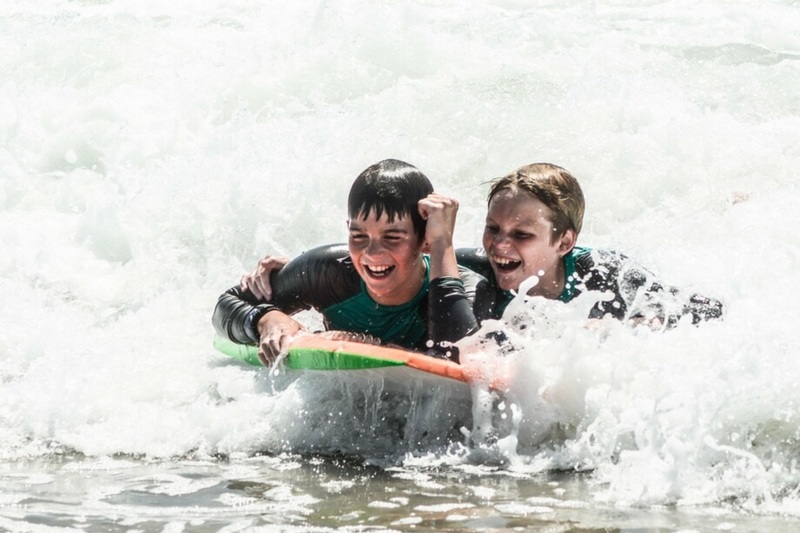 Having explored different beaches at different times, campers will understand how both the tide and the position of the beach can change the formation of the waves. In addition to working on surfing and water skills, we’ll continue to develop our ocean knowledge with an interactive lesson on barrier islands. After lunch on the beach, we’ll head to the North Carolina Aquarium. Many campers have visited North Carolina Aquariums, but we get to see one from a completely different perspective. We’ll be guided through a behind-the-scenes tour to see all the marine animals that are kept on display, as well as some areas that you don’t see on a typical aquarium visit. Campers even get to feed the fish! 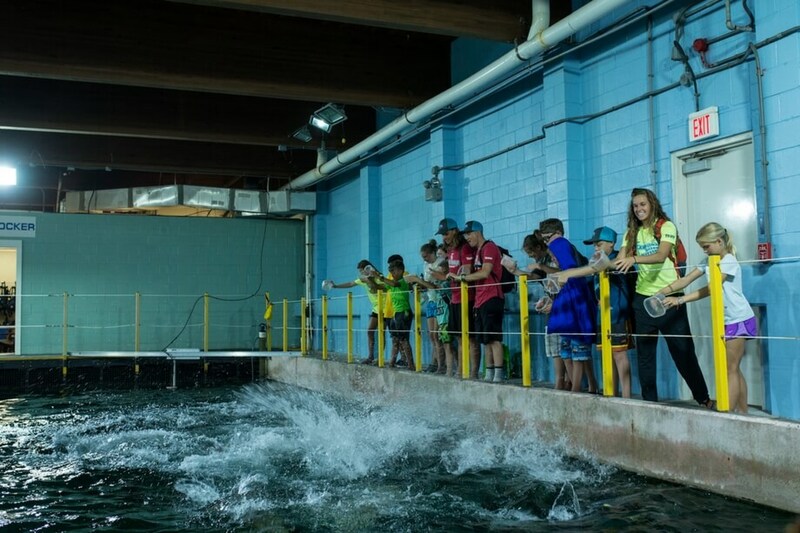 It may even inspire your camper to become an aquarist. We will round out this day back on campus with a camp-wide dance party event. Surf day round two! 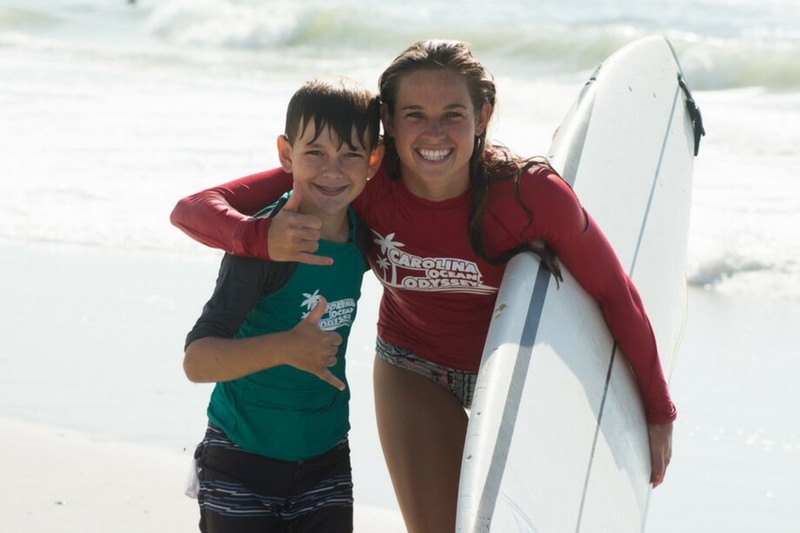 Today, your camper builds on the skills learned Wednesday with a second day of surfing. We believe in a step-by-step teaching process that gradually builds confidence and understanding one day, and one wave, at a time. 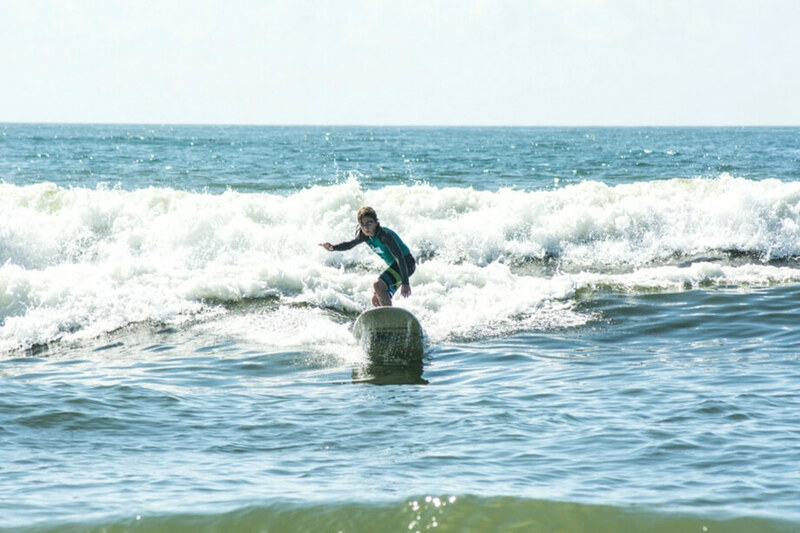 By having a second day of surfing, campers have another opportunity to hone their surfing skills, build ocean confidence, and practice. Surfing is a multi-faceted, learned skill. It is the culmination of every skill we have worked on throughout the week. Barrier islands are long, skinny strips of land that are vital to protecting our coast from storm surges and hurricanes. We will be traveling to the backside of Topsail Island where you can find one of the most productive habitats in the world, the salt marsh. Campers will use dip nets, seine nets, and cast nets to catch and release some of the inhabitants of this ecosystem. 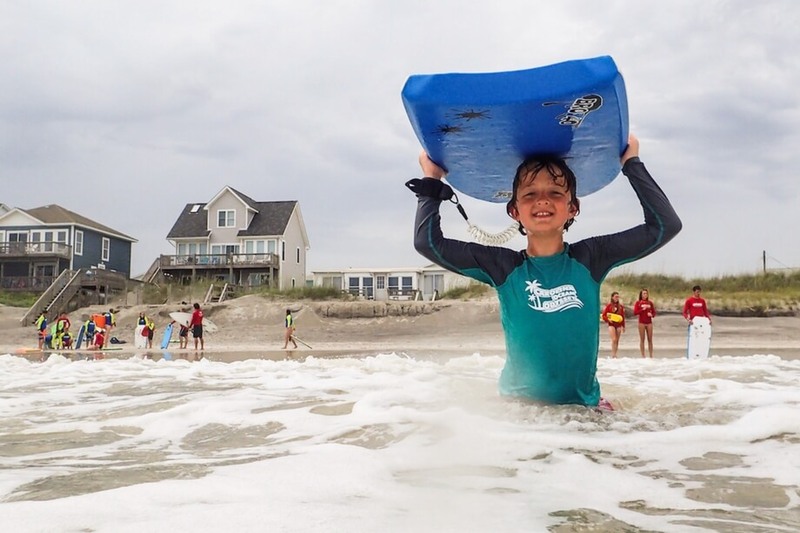 This beach day will be filled with surfing, riding waves, exploring the salt marsh, and beach games. After dinner we will head for the camp-wide closing campfire. It is the final day of camp so we will start it off with a wave riding ocean session. Now that we’ve got a week of water activity under our belts, you’re bound to see an improvement in your camper’s ability. Campers will be paddling out and catching waves like pros. After this session, we will head back to the rooms to pack and clean up before check out. It will be tough to say goodbye at the end of the week, but we know your camper will leave with new friends, new skills, and incredible memories! *This is a sample itinerary. Activities can change due to conditions. Your home away from home will be Topsail Island’s premier ocean view beachfront retreat center. Located just steps away from one of our favorite surf breaks and pristine beaches. Campers not only wake up to the sound of waves crashing and the feeling of ocean breeze on their faces, but also enjoy amazing sunsets, awesome prepared meals in our dining hall, beach volleyball, game rooms, fire pits, beach movies, and many more activities. 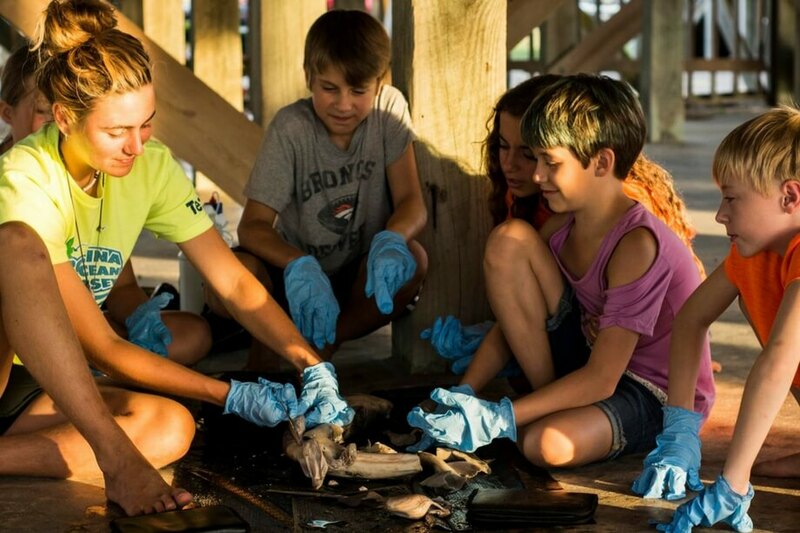 This exciting summer camp is in partnership with our marine science division at Sea Turtle Camp! A complete packing list will be included with your camp forms once you’ve completed the enrollment process. How old are the campers my child will be rooming with? Roommates are grouped together by gender and age in order to enhance the overall level of comfort. Yes, we can accommodate many dietary restrictions and preferences. If your camper requires a special diet, we are happy to ensure your camper’s dietary needs are met. You will be asked about food allergies and special diets in your camper forms. Should my camper bring a friend? Are the kids going to get to surf during Camp? 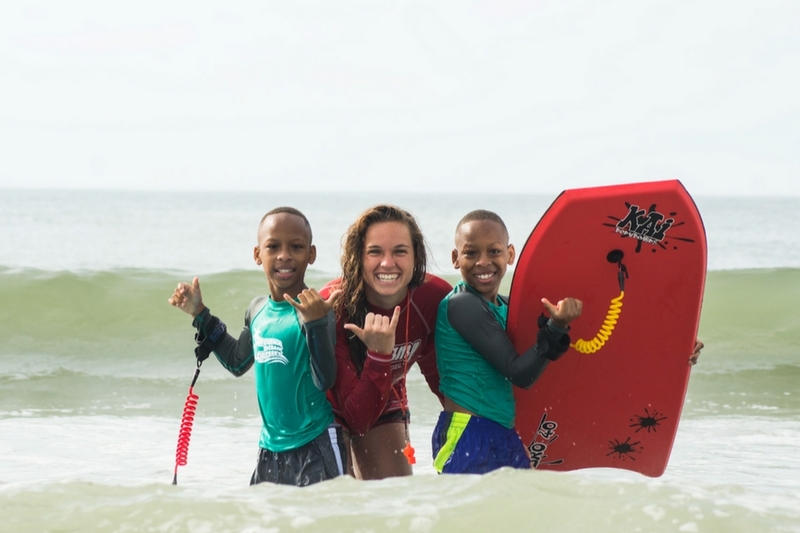 Yes, campers will participate in one surf session during the week. When not surfing, we will spend the rest of the week participating in other water activities such as boogie boarding, kayaking, stand up paddleboarding, canoeing, or sailing. 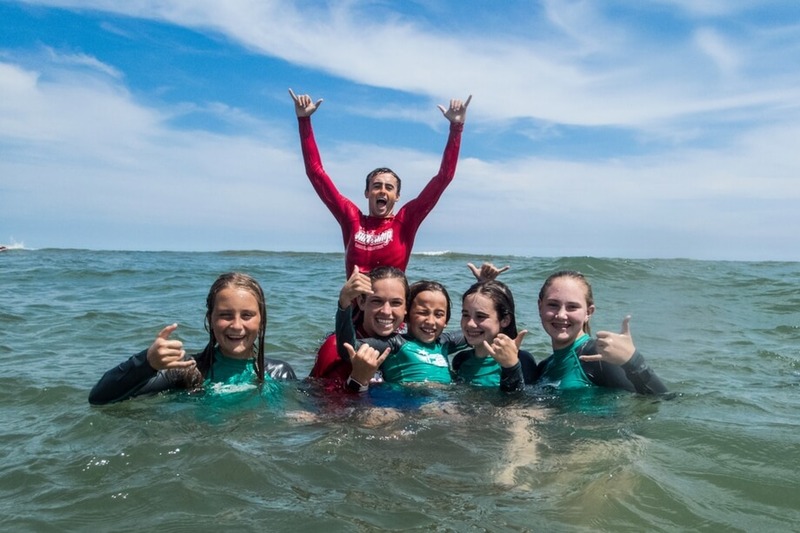 If your child wants a program that is primarily surfing please check out our Kids Surf Camp or WB Teen Overnight Surf Camp programs. My child isn’t the strongest swimmer, is Carolina Ocean Odyssey for them? Since water activities are physically demanding, we do require that campers be able to swim 25 meters unassisted and be comfortable in water where they can’t touch the ground. Campers that are looking to build their water stamina in the ocean should consider our Kids Camps. These programs are specifically designed to improve kids’ comfort level in and around the ocean. Will my camper see real live sea turtles? We will visit the Karen Beasley Sea Turtle Hospital and have a private tour where your camper will see and learn about real live sea turtles. This is my camper’s first overnight camp. What if my camper gets homesick? Homesickness is a completely normal feeling that happens to most everyone at some time in their lives; it can occur in campers of any age and not just first time campers. Our professional camp staff has experience from many different fields including education, marine sciences, and youth development. 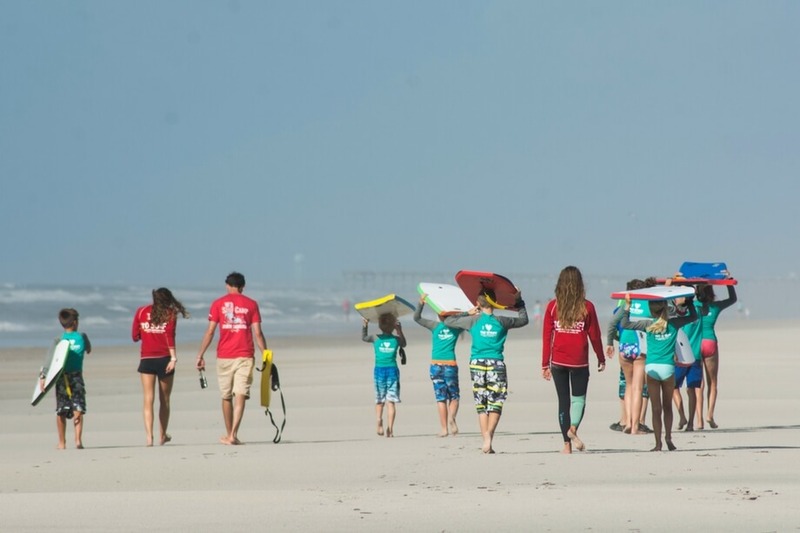 They are all American Red Cross certified lifeguards and have undergone an intensive week long training that includes the proper handling of homesickness, childhood development, surf coaching, ocean safety and behavior management. We have processes and procedures set up to work through camper homesickness. Our goal is to be “partners in parenting”. We will provide your camper with a safe and fun new experience that they will remember for the rest of their life. Can I send them with a cell phone or will they have the ability to call me? If you would like, you can send you camper with a cell phone for safety purposes when traveling. However, upon arrival to camp, your camper’s cell phone will be collected by staff and returned on the last day of camp. We have found that the best way to overcome homesickness is to keep the energy and stoke level up and to keep your camper’s mind at camp. By calling home or home calling them, campers are focused on what they are missing and not on the fun they are having. In the case of an emergency, you can call our Program Coordinator who will handle the situation as needed. We accept checks, money orders, or VISA/MC/AMEX credit cards. All credit card payments are processed online using a secure server. There is a $50 service charge for all returned checks. With the exception of the deposit, a 3% credit card surcharge will be assessed to all payments made by credit card. Please review our cancellation policy. Deposits are not refundable after acceptance into a program. What if we can’t get in by the set check-in time? Please contact our Program Coordinator to discuss arrivals and departures outside of our preferred times. In order to avoid missing any planned activities, participants should arrive at camp between 2:00 pm – 4:00 pm on the first day and depart between 11:30 pm – 12:30 pm on the last day of camp. What airport is best to fly into for your program? Do you provide a shuttle service? The best airport to fly into is the Wilmington International Airport (ILM), which is located a short drive from our camp facility on Topsail. Our camp staff will meet all participants at the airport and provide transportation to and from the camp facility. What if my camper’s luggage doesn’t make it? Occasionally the airlines will misplace luggage or your suitcases will miss connecting flights. We recommend keeping essentials, such as medications, toiletries, bathing suit, and extra change of clothes, in carry-on luggage just in case. Our camps are extremely high quality, tight margined programs, with limited space. Therefore, once your student has been accepted into the program, exceptions to this policy cannot be made for any reason, including weather or personal emergencies. Please review the terms of our cancellation policy found here. In order to enroll in camp you must agree to these terms. We recommend campers bring $75 to $100 per week of camp. This is for snacks, souvenirs or gifts they wish to purchase while at camp.